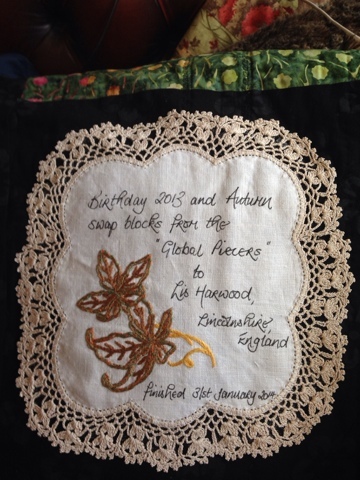 Today I have finished my quilt made up of birthday blocks received from my friends in the Global Piecers (plus a block I did in a Pat Archibald workshop at Festival of Quilts). I have posted about this project at various stages. I struggled with the busy-ness (is "business" correct, it doesn't feel right?) of the blocks and got some good advice from Wendy at Camelot Crafts about introducing somewhere for the eyes to rest, in the plain black frame around the blocks before the border. 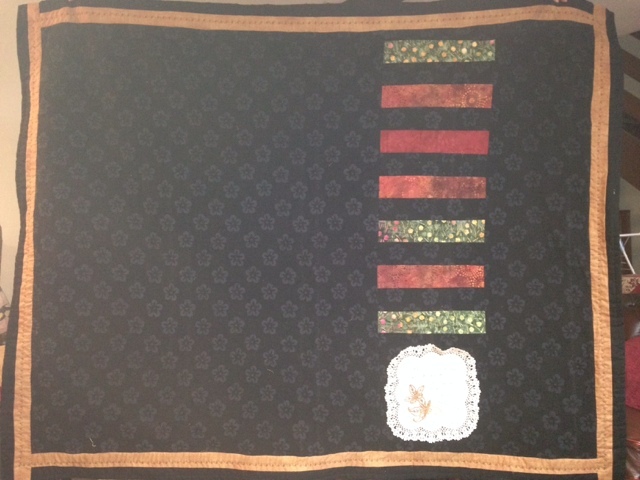 There is a mix of hand and machine quilting and I incorporated some of the extra fabric I was sent in the sashing and in the detail on the back of the quilt. The label is a little tray cloth that fits the leaf and Autumn theme. Thanks GP ladies, I will be thinking of you all when I use it. How wonderful to have finished this project. The black border certainly does the trick, and brings the whole piece together. This looks so good, well done you. I must get on with mine. Aren't you as very lucky girl! I like the idea of the different sashing colours between the blocks, and the little buttons too. Congratulations on getting it finished, now you can snuggle down and enjoy it while reflecting on your stitching friends. It's a lovely quilt Lis and I love the doily label. What a great idea! Although I agree it is a rather busy quilt, it is lovely. If you use it as a lap quilt and only parts of it is exposed at a time you can sit forever and enjoy the various patterns. 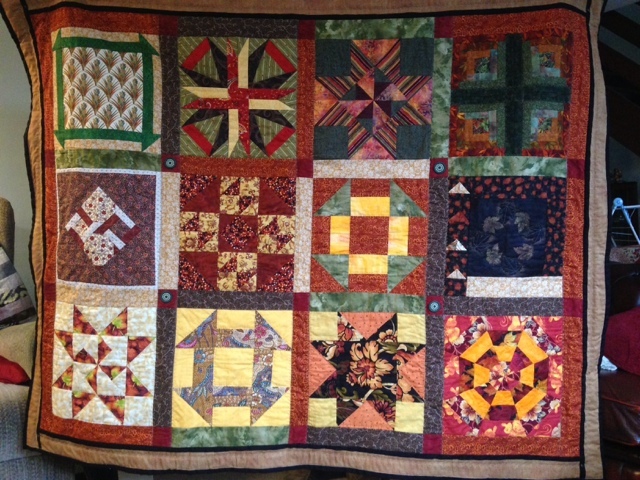 That will also make your thoughts wander to the different quilters who contributed the blocks.